14.5" ELW Barrel w/ BCM Mod 1 Pinned and welded to bring it to 16"
Happy with everything at this point, and will throw out some more detailed reviews/thoughts around some of the components here in the new future. Weight sits just under 7 pounds without a mag, over 7 pounds with a mag. Very handy, well balanced and comfortable AR. Pretty much exactly what I want. The Troy's are much more what I am looking for in BUIS than the Magpul PROs were. The Arisaka light setup puts the light exactly where I want it, with a lightweight, low profile mounting solution. The Microsight is slick and well proven, and purchased second hand for a pretty good deal. Went with the absolute witness mount as that's what I'm used to. I may get some kind of variable magnified scope to switch in and out in the future. Larue's really nice QD mount should facilitate that. 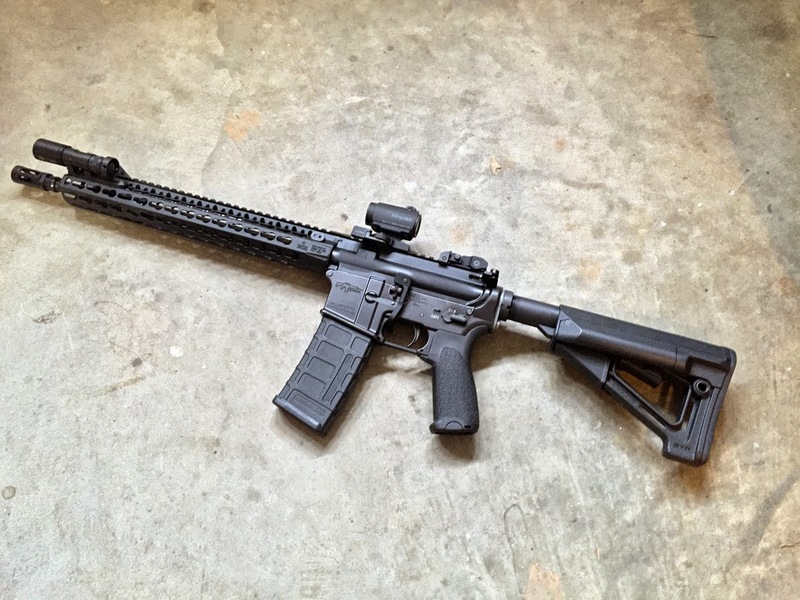 The Gunfighter grip is a huge improvement over the old Magpul grip that I was using, as it has an angle more appropriate for a modern shooting stance, and thus makes the AR a hell of a lot more comfortable shoulder. The old grips end up putting strain on my wrist, which gets annoying after a time. Life, southern ice storms and waiting on optics and sights to arrive has delayed the initial break in. Should be sometime this next week, and I'm looking forward to throwing some lead with this thing. As thread title suggests, I'm not entirely done. Need a better charging handle - planning on picking up a Raptor. Need a forward sling QD mount. Probably an upgraded trigger, too. And might swap out the stock.